Bustard (otis), a large bird, peculiar to the dry, grassy plains of Europe, Asia, and Africa. It has not been found on the American continent, and only one species in Australia. Bustards were formerly abundant in Great Britain, on the open wolds of Wiltshire, Dorsetshire, and some parts of Scotland, where it is said that they were coursed with greyhounds, which is by no means impossible, as they cannot take wing easily or without considerable preparation, and when hard pressed on a sudden have the habit of running with their wings outspread like sails to assist them, after the manner of ostriches, with which they have several points in common. 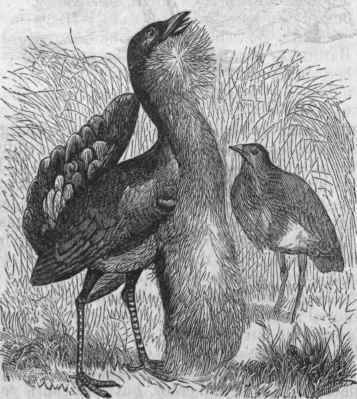 There are two European species of this bird, which appears to form a connecting link between the gallinaceous tribes and the ostrich and cassowary. 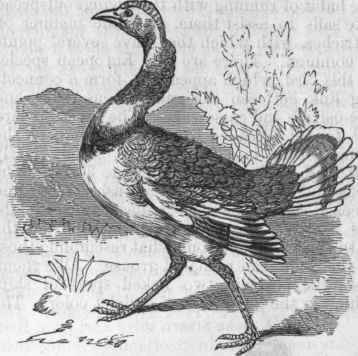 The great bustard (0. tarda), so called from his heaviness on the wing, for he is a fleet runner, stands nearly 4 ft. high, and weighs from 25 to 30 lbs. The head and neck in the male are ash-colored, and on each side of the neck he has a tuft of feathers nearly 9 inches long springing from the base of the bill, and somewhat resembling those of the American pinna'ted grouse. Like them, also, they overlie two naked spots of skin, which in the bustard is of a violet color. The upper parts of the bird are beautifully variegated with black and rust color on a pale reddish ground. The belly and sides are white. The legs are long, naked above the knee, dusky in hue, and have no hind toe, but a callous prominence serving as a heel. The male bird has a water sac in the fore part of the neck, having its entrance under the tongue, capable of containing two quarts of water. The female is much smaller than the male, and less brightly colored; her neck and head are brown, and she has not the curious water sac. 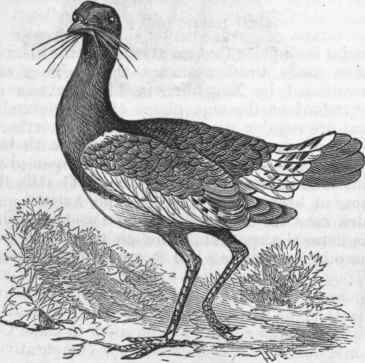 The other species, the little bustard (0. tetrax), is only 17 inches long. It generally resembles the larger species in form and color, but its head is reddish brown, while the neck of the male is black, with a narrow white border above and below. The upper parts are mottled with the same colors, but with finer and more delicate lines. This species is very common in France, where it is a shy, cunning, and wary bird, frequenting the barren heaths of Brittany and those singular tracts known as the landes. The flesh of the bustards, of both species, is excellent, superior, it is said, to that of the turkey; and it is singular that no attempt seems to have been made to domesticate them. They are mentioned by Xenophon in his Anabasis as abundant on the sage plains of Mesopotamia, and are regular autumnal visitants of northern Greece, where they are confounded with the wild turkey. - There are four other species of bustards which are less known. The black-headed bustard (0. nigriceps), an Asiatic species, inhabits the highlands of the Himalaya, and also the open Mahratta country, where it lives in large flocks, and is regarded as one of the greatest delicacies as an article of food. It is nearly 70 inches long, and its colors above are pale bay undulated with rufous brown. Its head, as its name indicates, is black; its neck, belly, and under parts white, with the exception of a black patch on the breast. The 0. cmrulescens of Africa was discovered by Le Vaillant in the interior of the Caftre country, S. Africa, and in some parts of Cape Colony. It appears to have no name in the vernacular. Its coloring, like that of the other species, its congeners, is reddish brown above, with the under parts of a pale bluish gray. The kori bustard, discovered by Burchell on the banks of the Orange river, is about 5 ft. in height,, and but 7 in extent from wing to wing, while its plumage is said to be so thick as to be proof against anything short of a rifle ball. Little is known of its character or habits. The 0. Denhami, discovered by Major Denham in central Africa, is another large species, not less than 3 ft. 9 in. in height. It is found in the grassy districts immediately south of the great desert, in the regions of Lake Tchad. It is not numerous, and is always found in company with gazelles, like which it is famous for the brilliancy of its eyes. The Australian bustard (O. Austialasiana) is larger than the European, higher on the legs, and with longer neck; the male weighs 13 to 16 lbs., and is a majestic-looking bird. It has a large pouch on the front of the neck, which may be inflated so as nearly to touch the ground. This development is peculiar to the breeding season, and is connected with the vocal organs, then abnormally exercised. The colors and habits are as in other bustards.